What will the 45th President of the U.S. Donald Trump's foreign policy be like? This question interests the whole world. But Russia and its president Vladimir Putin personally are more interested in what Washington’s policy will be towards Russia. 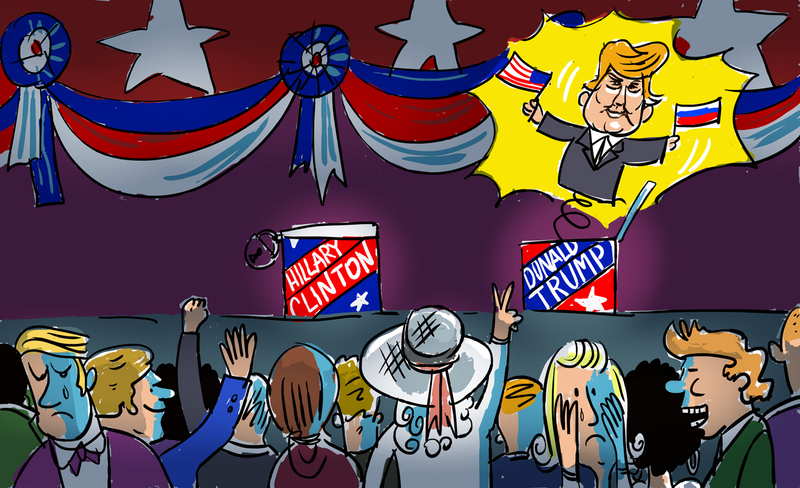 There were few analysts who expected outsider Donald Trump to win the U.S. presidential election on Nov. 8, which is why most attention was fixed on the foreign policy team of former Secretary of State Hillary Clinton. It was said that Trump does not understand much about foreign policy and his foreign policy advisors were low-profile individuals. But the problem of finding knowledgeable advisors can be solved in very little time. The American expert community is rich in talent and the number of those wishing to move to (or come to) the team of the surprise winner in the most dramatic and unexpected presidential race in post-war American history will be rather high. At the same time, the U.S. president usually leaves a large personal imprint on foreign policy, in which he has more authority than in domestic policy. Therefore Trump's foreign policy is expected to be vivid. In all senses. However, not as "vivid" as could have been imagined when listening to his extravagant statements intended to attract an election audience. For example, he is hardly likely to build a "wall" on the Mexican border in order to prevent the flow of illegal immigrants. Such a wall would require serious money and it is the U.S. House of Representatives that has the right to initiate any budget allocations. And no one else. Trump will also make the migration policy more severe and will definitely not promote Obama's plan to amnesty seven million illegal immigrants already residing in the U.S. Neither will he promote the various global trade-integration plans such as the Trans-Pacific Partnership. On the contrary, he will try to strengthen the emerging trend of gradually returning jobs created by American corporations to the country. He will not unleash a trade war against China but will try to reach an agreement with the country concerning compromises and certain concessions. Concerning Russia, had Clinton been elected president, U.S.-Russian relations would have likely been doomed, in the best scenario, to stagnation and in the worst – to further degradation and even dangerous escalation. The election of Trump provides the possibility of this escalation not happening. In terms of psychological character, the eccentric and extrovert Trump is the complete opposite of the introverted and "closed" Vladimir Putin. However, it seems that for the former KGB colonel it is easier to communicate with people who are more open and forthright (even if they express contrary judgments) than with those like Hillary Clinton. Many people, not only in America but also in Moscow, believe her to be "untruthful" (to use a euphemism) and hypocritical. Some even suspect that she, when heading the U.S. State Department, initiated and "paid for" the protests in Moscow in fall 2011-spring 2012. And after the extremely brusque statements concerning Russia and Putin personally that she made during the election campaign, accusing the Kremlin of wanting to "undermine the elections" and "plant Trump the marionette in the White House," it is unclear whether Putin and Clinton would have been able to communicate calmly and without mutual agitation. Putin does not have this type of "credit history" with Trump, therefore their relations can be started from scratch. In this sense Trump somewhat resembles Moscow's former "chief European friend" Silvio Berlusconi. He may say or do something "off the cuff," and even in relation to Putin personally. As a response, Putin may "get offended." And since U.S.-Russian relations still strongly depend on personal relations between the presidents, the situation can swiftly deteriorate. Basically, there is only "one step from love to hate." Now Putin was the first world leader to congratulate Trump on his victory. But he was also the first to call President Bush on Sept. 11, 2001 to express his solidarity with the fight on terrorism and condolences to the families of the victims. Then there was the famous Munich Speech, which was full of disillusionment with the West and with America in particular. That is why it is still unclear what Trump's slogan "Make America Great Again" may result in. If he, as expected, tilts towards "neo-isolationism" and the reduction of America's involvement in the world is confirmed, it will have a positive effect on America's relations with Moscow. If Trump remains faithful to his election statements (even if they are not fully clear) that America should not interfere with Ukraine and need not be interested in the fate of Crimea, this will also be a great impetus for a new "reset." America ceasing to apply pressure on Europe not to weaken the sanctions against Russia is also important. Although Trump, even if he wanted to, would not be able to weaken or remove the American sanctions since he would be hindered, despite party affiliation, by the Republican majority, not to mention the Democrats from both houses in Congress. "In exchange" for the reduction of support for Kiev, Russia can make concessions to Washington in Syria. That is, if Syria remains a priority on Trump's foreign policy radar. His earlier statements concerning placing the burden of military and financial responsibility for NATO on America's European allies would also suit Moscow. However, Trump is unlikely to renounce the deployment of the global antimissile defense system, which extremely worries Moscow, since this is compatible with his "neo-isolationist" rhetoric. But the newly elected president's plans to reopen oil production in Alaska may have a detrimental effect on Russia's economy because this would lower world prices on energy, Russia's main source of export revenues. Thus, Trump, although "unpredictable" in many ways, is still a hope for a new "reset" in U.S.-Russian relations. Whatever the case, in the international arena Trump's America will look completely different than Barack Obama's or even his predecessor George Bush's.